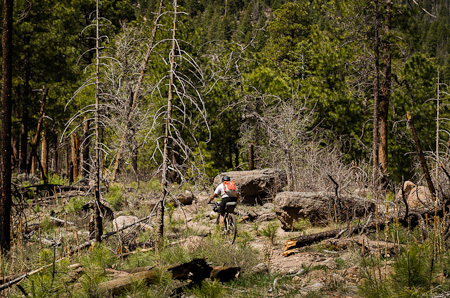 As I mentioned in my previous post, the Coconino Loop is a bikepacking journey around the Coconino National Forest, Northern Arizona. 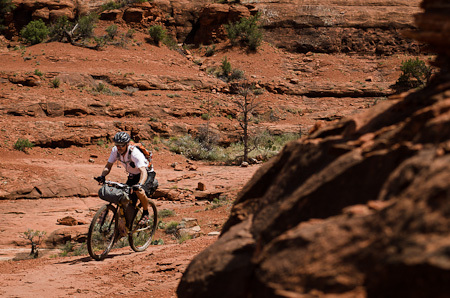 Concocted by Scott Morris, of Topofusion fame, and his buddy Chad Brown – both bikepacking fiends – it knits together 250 miles of trails and jeep tracks, with only a handful of paved miles to its name. 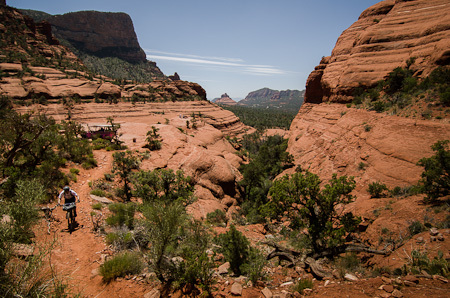 It’s an incredibly diverse loop, flitting from corridors of ponderosas pines to the open, red rock desert of Sedona, via Cottonwood, Mingus Mountain, the Verde River and Williams. 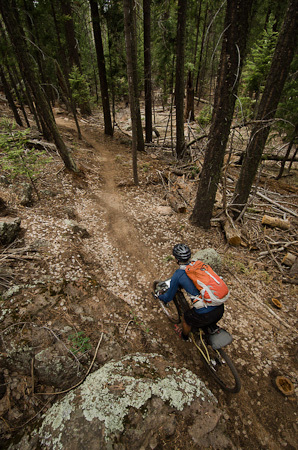 I say ‘bikepacking’ because the route claims to be almost 50% singletrack, much of which is relatively technical. 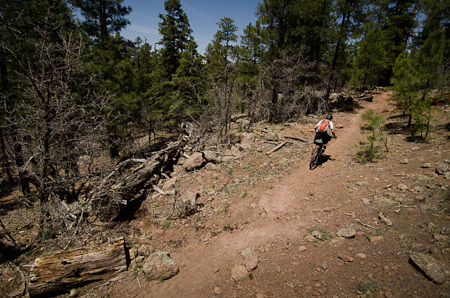 Between the slabby trails of Sedona, the medley of rough jeep tracks through the ponderosas, and the vertical challenges of Mingus Mountain, it’s certainly tough enough to warrant packing as light as you can – so forget panniers or a trailer on this one. As mortals, we rode it in 4 and a half days, largely due to my obsession for taking photos and a couple of late starts. I’d add to that our first day out of Flag was slowed down considerably by tacky, clay-like mud on the Anderson Plateau, having rained the night before. 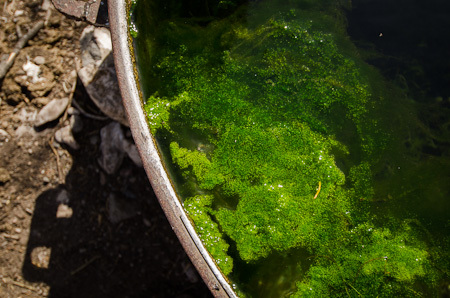 A tenacious compound, it ‘slo-moed’ us down to a literal standstill, jabbing hopelessly with twigs to clear clogged drivetrains. So, keep an eye on the weather if you’re planning the ride. 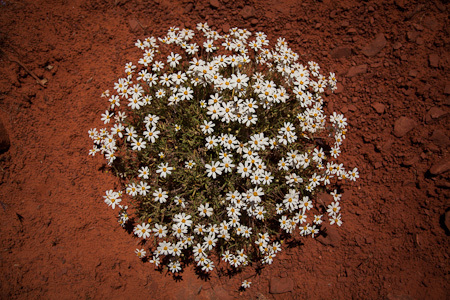 Spring and Fall are best, to avoid the sweltering heat of Sedona. 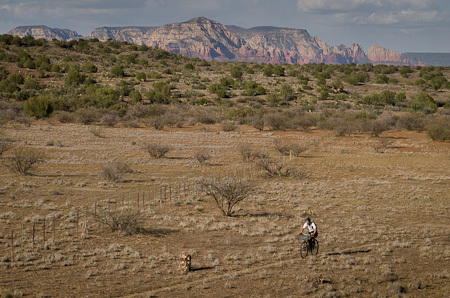 Although the parts of the route that follow the Arizona Trail are well signposted, you definitely need a GPS for this ride. 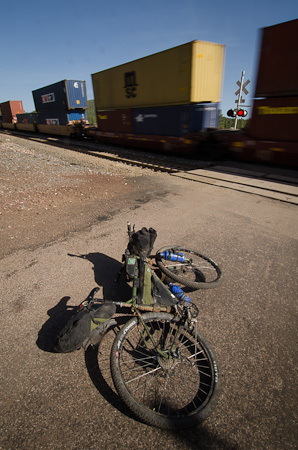 All the relevant info can be downloaded from the bikepacking.net. I used my lovely new Garmin Etrex 20 (thank you Nancy!) and though I have yet to unearth all its secrets, I’m now a GPS convert. Battery life was great – at least 40 hours with lithiums AAs, leaving it on and not fiddling with menus during the day. I’m all for shouldering the bike if it gets me to places I’d otherwise not be able to reach – or to avoid pavement. But if there’s a good dirt road alternative, I’m happy to take that too. To avoid the route’s most infamous hike ‘n bike, I’d recommend taking the Mingus Mountain Bypass (there’s a separate gpx file) which skirts round the top of the mountain, keeping to mellow, scenic forest roads for the most part. It meets the main route some 10 miles later. 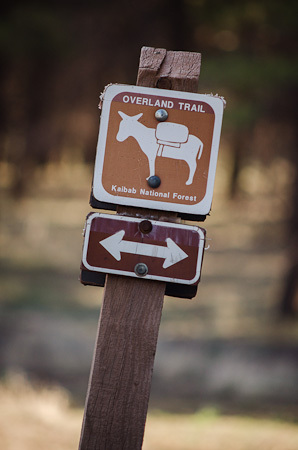 We noticed that it’s also possible to turn off onto a graded dirt road at a couple of points on the way up to the Bill Williams Overlook, saving yourself some potential off-the-bike toils. If the trail on the other side is littered with blowdown, you can follow the dirt road down into Williams too. I rode my Surly Ogre with my usual Porcelain Rocket kit. I was travelling light, but not as light as most. The Ogre carries a few extra pounds round its waist (easily slimmed back with a lighter wheelset) and I had some 6.5 lbs (3kg) of camera kit to lug round too – my DLSR and a few lenses, plus spare battery – so I certainly wasn’t riding as light as I could have been. Gary took his AM Peirce, fitted with a 1×9 drivetrain and Stan’s ZTR tubeless rims, weighing in at around 25lbs. His full rig (minus food and water) tipped the scales 34lbs 12oz (15.7kg), plus 5lbs 10 oz (2.56kg) in his pack. Gary knows how to pack! He had tubeless tyres and I ran sealant in my inner tubes. 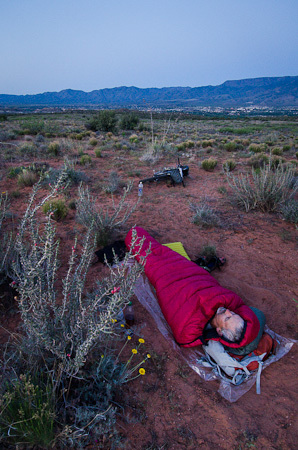 We both packed lightweight tarps (only used one night), and made sure we had enough layers for cooler conditions. I carried my Clikstand cookset, while Gary relied on cold food. Here’s just an overview of the ride – I’m saving some photos for a story I hope to write up… You can check out Gary’s pics here. 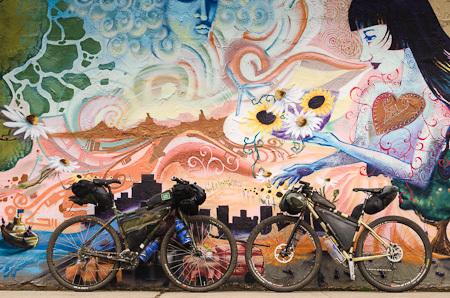 The two bikepacking steeds. My Surly Ogre, and Gary’s AM Peirce. 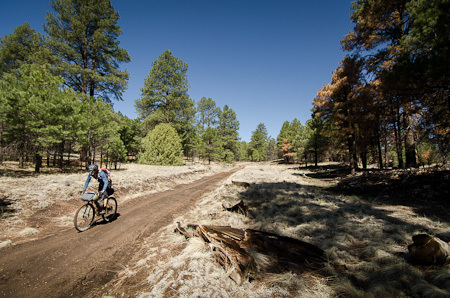 Easing into the ride on the Arizona Trail at our start point of Flagstaff. We met this Japanese AZT through-hiker on the route. 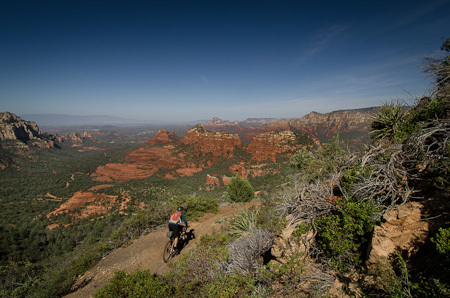 Apart from in Sedona, we didn’t see anyone else on the trails. 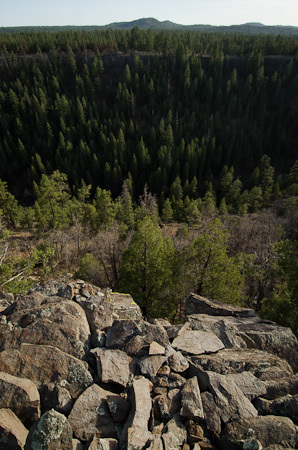 Dropping down from the Mogollon Rim at Schnebly Hill Overlook. 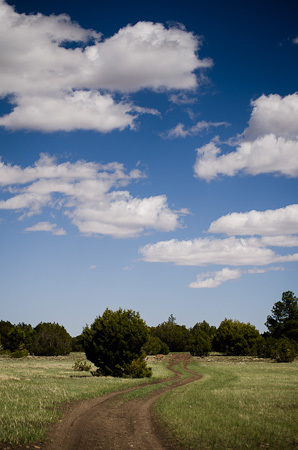 Built in 1902, the Old Munds Wagon trail was used by homesteaders in the Verde Valley to sell produce and livestock in Flagstaff. 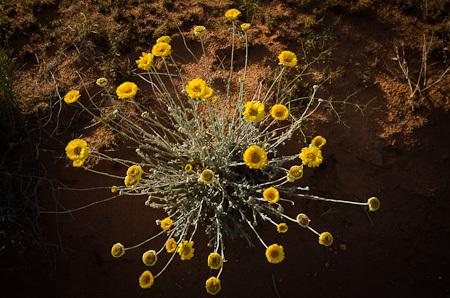 Spring is in the air – a wonderful time to be in the desert. 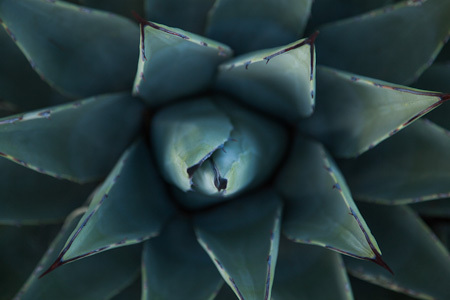 Our descent into Sedona marked a change in flora – we were entering the land of agave and cacti. 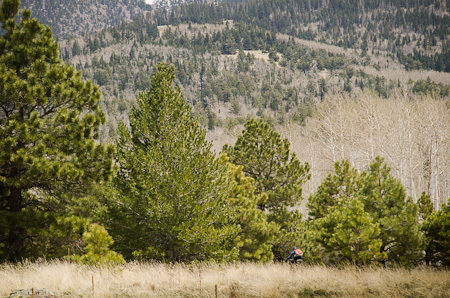 It’s also a mountain biking mecca. 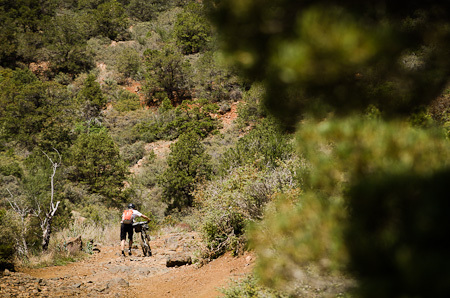 The Coconino Loop weaves one trail together with the next – like Broken Arrow, a Sedona Classic. 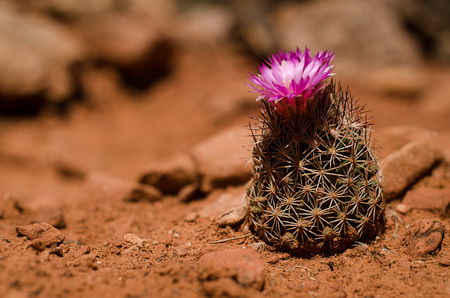 Catching these miniature barrel cacti as they began to flower was a highlight of the desert experience for me. The waters of Buddha Beach were so tempting we crossed them without even needing to, straying briefly off route. 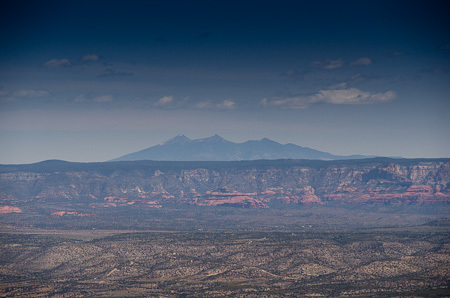 Leaving Sedona for solitude once more. 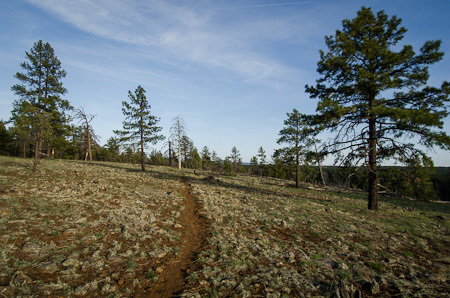 The Lime Kiln Trail was originally constructed in the 1880s to burn lime; now it’s just the wisp of a sandy path across the desert. 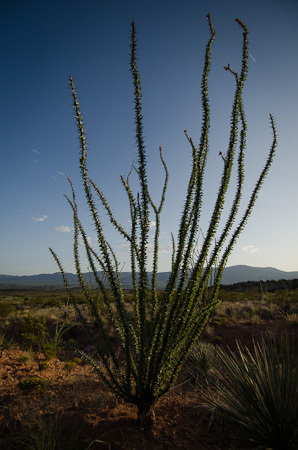 And the desert rat’s favourite, the spindly, spikey occatillo cacti. No need for the tarp… A perfect camping spot on a plateau above Cottonwood. Cottonwood lured us in its grocery store, where set up camp for an hour of feeding and gear repairs. Climbing back out from Cottonwood towards Mingus Mountain was tough in the heat; sweat flowed off my helmet peak like a waterfall. That’s San Francisco Peak in the distance, where we began. Tired legs and loose rocks = some pushing. The classic hide of an alligator juniper, as we climbed up in altitude once more. The route unearths all kinds of rarely used jeep tracks. 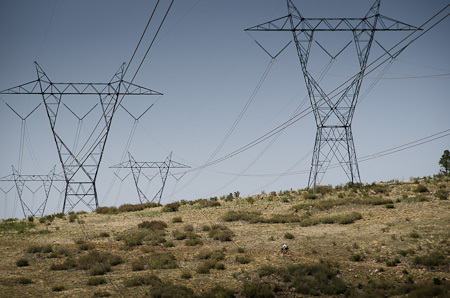 At one point, we followed a powerline for a few miles across the valley. Coyote Springs offered a welcome chance to stop for lunch and refill water bottles. Despite the life forms, we didn’t bother to purify it, and lived to tell the tale. 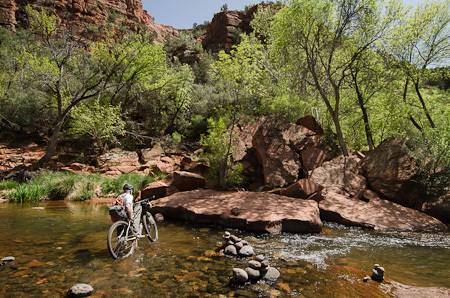 Stopping to soak it all it up, before the gravel road descent back down to the Verde River, where we camped the night. 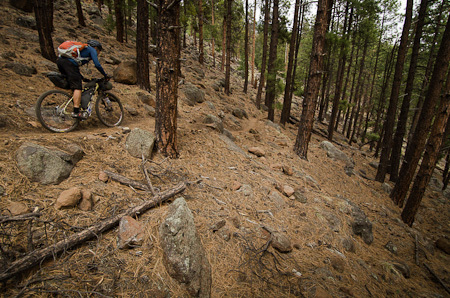 But we ended up climbing back up to 9000ft, culminating with an infamous hike ‘n bike. Blowdown made our much anticipated descent from the Bill Williams lookout more of an assault course than a ride. 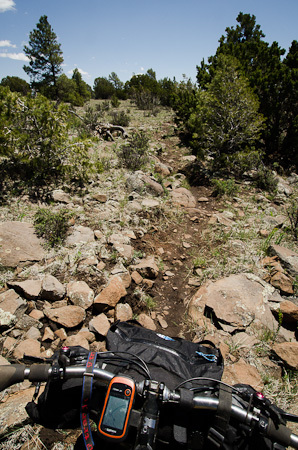 Eventually, the trail opened up once more for some sweet riding. 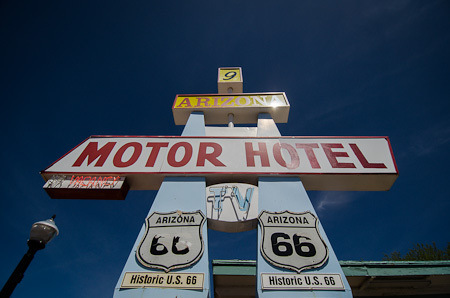 Williams – on the National Register of Historic Places – boasts some classic signage that harks back to the historic Route 66. I’m a sucker for ’50s Americana. 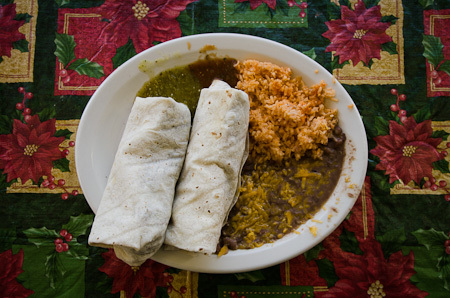 It was also home to the most excellent Rolando’s Mexican Restaurant. This double burrito special cost $9, and fed me for both lunch and dinner. You need to stop at this place if you’re doing this ride. A good excuse for a break: waiting for the cargo train to chug by. 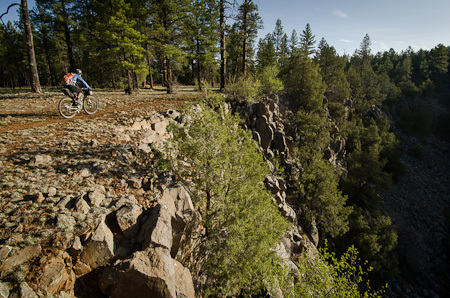 Before long, we were back amongst the avenues of ponderosas once more. 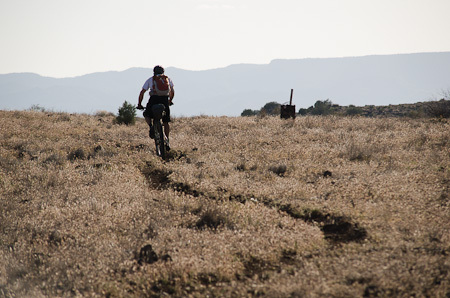 Great views and campspots abound… The latter part of the trail smooths out, reward for previous toils! Eventually we closed in on Snowbowl, back up at 9000ft, at the foot of the lofty San Francisco Peak. 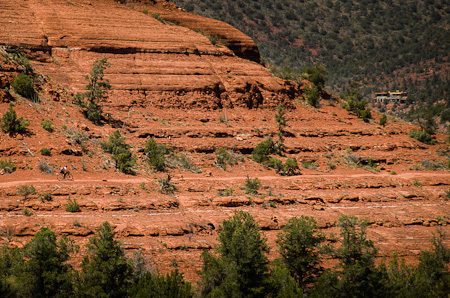 From here, 14 miles of AZT awaited, a ribbon of singletrack perfectly crafted into the hillside. 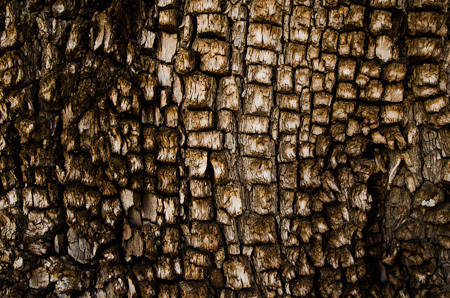 We weaved between rock and tree with effortless grace. Cheers Gary! 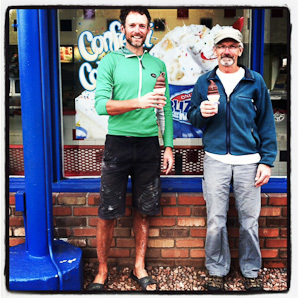 End of ride celebration at the Dairy Queen. I was carrying my Nikon body with a lens (12-24 generally) in my pack – a Camelbak. Then I had my second lens in my framebag (Sigma 50-150) and a smaller 50mm 1.4 in the front pouch. 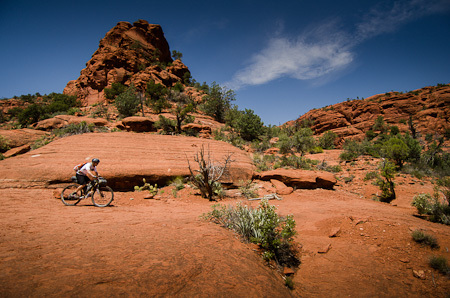 When I’m touring, I’m not crazy about having weight on my back, but for mountain biking trips like this, it’s ok. And I feel like it offers the best protection for the camera. On the trip, I tried to keep most of my water on the bike, and just a little in the Camelbak. Brilliant photos Cass! 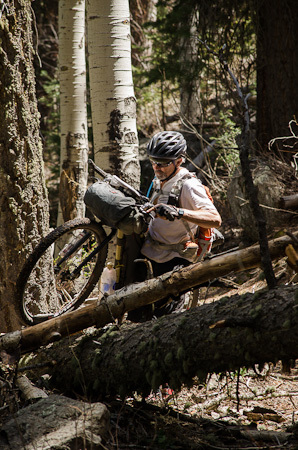 I’ve instantly added Coco-di-Loco to my bikepacking to-do list. The high desert of the Southwest is one of my favorite places in the world. By the way, how are you carrying your camera kit these days? I notice you’ve dropped the Ortlieb handlebar bag, which you mentioned on the gear page. I’ve been stuffing my Nikon into my framebag, but I’d love to hear your ideas. Thanks! Great post, as always. Oh how funny … Ken and I had the same question at the same time. Do you go with the Ortlieb on longer tours? Exactly. I still find the Ortlieb hard to beat for more conventional touring. It’s waterproof and quick to remove. 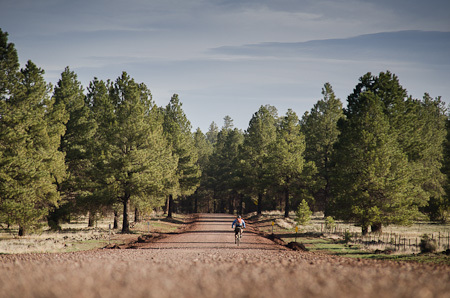 But for this kind of ride, where the camera is on my bike, it’s nice to get rid of it. The front soft pouch doubles up as a useful gizmo bag in my trailer or panniers. Unfortunately, the Ortlieb mount is a pain to remove. For non oversize bars, I prefer the Vaude Flickfix mount, which is compatible with the Ortlieb bar bag. Great blog all around that inspires me to get out more. Well done. Would be cool to see larger images though. Yea, too bad such incredible photos are so small! I think the boys doing this ride non-stop would definitely qualify as “loco” as well as supermen. It’s odd, they seem so normal when talking with them. 🙂 Unless one has experienced this ride they can’t really appreciate what a feat it is to ride it straight through. It is the most demanding bikepack I’ve done. They’ll be scampering up the Mingus Mountain hike ‘n bike before too long, I expect… I preferred our route! Awesome trip! I’m doing the GDMBR this summer. I’m riding south to north and was wanting to know about the water sources in NM. I’ll have a 3L pack plus 2 24 oz bottles. Do you think this is enough for NM? I’ll also have a filter. Thanks man. 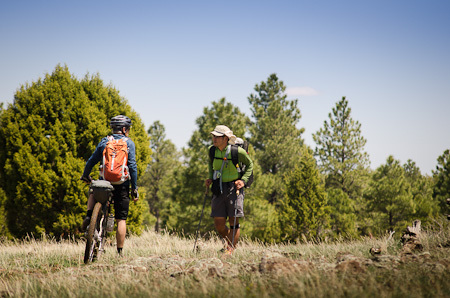 I’m not an expert on the New Mexico section, but from what I remember, sounds ok. You bikepacking it? Personally. I’d prefer to have less water on my back and more on the bike, but it depends on what works best for you. I’ve never needed a filter, but I’m also not too fussy about my water sources. I prefer to carry a bottle of iodine or some puritabs for the odd occasion that I might need them. Saves some weight. Andrew, without knowing how many miles you can comfortably do a day it’s hard to guess how much water you need. If you study the Adventure Cycling Divide map you’ll have a good idea of how far water sources are apart. I like to have the ability to carry enough water for 24 hours. I usually don’t fill up but if I need to I can. You could use 1 liter soda bottles in your bottle cages that you are now using 24 oz. bottles in. You can hose clamp a bottle cage under the downtube too. Patypus and MSR make folding bladders that would allow you to carry even more if you need it. Personally, I like to be able to carry around 5 1/2 liters of water. I’ve not had good luck with filters, they plug up too often and they’re heavy. I use Aqua-Mira drops. If the water has too many floaty things you can use a coffee filter to get rid of them if they bother you. I agree with Cass, I’m not that picky about my water. I was hoping you’d reply, Gary! Thanks! I can carry approx 3.5L on the bike (on forks and under downtube), and the rest I either put in my backpack (1.5-2L) or in panniers/trailer. Hi Cass, its Joelle from Olympia, WA again. I was wanting to do this trip, but only have a long haul trucker. Very new to biking, yet to have even done a bikepacking trip. My plans were to do it this summer, but am scared it will be too hot/ and my bike is not good for these roads. (long haul trucker)… I definitely do not want to be on the high way… do you suggest I get a new bike? or would new wheels do the trick? Also, would it be too hot/difficult to do this ride in the summer for a beginner? Thanks! Late comment to this post but I’ve got a quick question. I’m about to run the GDMBR with an Ogre fitted with Porcelain Rocket kit. I’ve only run panniers before so this will be a new experience. I saw you had a pic of your front fork with what looks like bottle cages AND Salsa anything cages on each fork leg. How did you get that set up? Actually, my Salsa Anything cage broke. 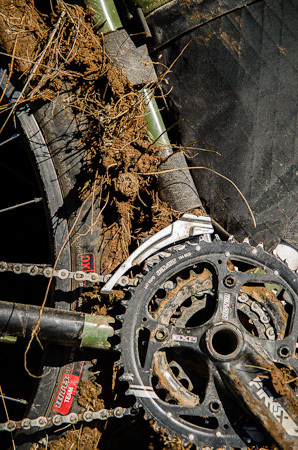 The Coco loop is pretty rough on kit – maybe it got snagged on one of the hike ‘a bikes. Not sure. Oh. So simple I’m embarrassed I had to ask. Appreciate the quick response. I’m actually hiking the PCT right now, and will head back to the Mexican border on the GDR, so I’ll have only about 24 hours in Banff to figure how to take the kit in my backpack and load it into my never-before-seen new PR set-up. I’m probably over-analyzing with long lonely days of hiking.